The weekend of August 9 – 11, 2002 saw about 40 people, including guests and family of alumni visit the camp. The weather was cooperative. As in past years, the Alumni Bursaries were announced during the weekend. The Alumni cricket team played very well, but was defeated by a well tuned and more densely populated staff group. It is heartening to see old staff members visiting the camp. The Association is fortunate to have the consent and cooperation of the council and senior staff at HSR who certainly assist in making this activity possible and successful. 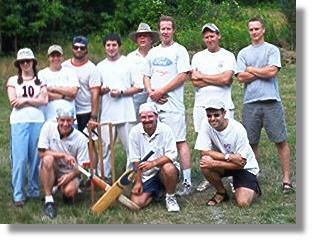 This entry was posted in Alumni Events/Activities, Reunions and tagged cricket, reunion. Bookmark the permalink.